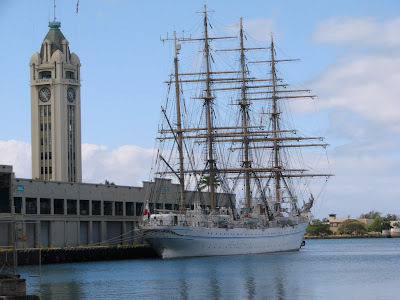 The Kaiwo Maru sailed into Honolulu and ported at the Aloha Tower pier. 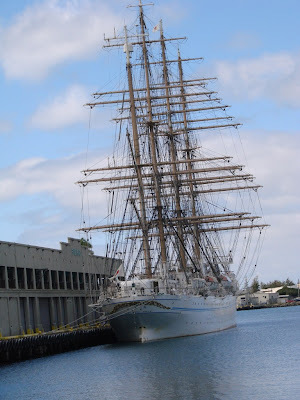 This is a four-masted training barque tall ship from Japan. It was built in 1989 and is 110 meters. The Kaiwo Maru is a regular participant in international tall ship gatherings and regularly sails across the world. I found just the right spot to snap the photo with both the boat and Aloha Tower in the background. Below is also a bonus photo of a more close up view of the ship. I could find a departure time listed but for those lucky enough to be there it will be a sight to see the the raised sails. This entry was posted on Friday, February 15th, 2013 at 12:57 am	and is filed under Feature, CityPhoto, Hawaii Photo of the Day, Attractions. You can follow any responses to this entry through the RSS 2.0 feed. You can leave a response, or trackback from your own site.